The early 2000s brought big cheer to the cotton farmers of India. With the advent of genetically modified (GM) seeds in 2002, popularly known as Bt cotton, the country soon emerged as the largest producer of cotton in the world. The seeds led to a drastic cut in the high cost of insecticides and pesticides required for the cotton crop. Today, Bt cotton from multinational agribusiness giant Monsanto grows in 96 per cent of India’s cotton farms. But there is bad news for the country’s 8 million cotton farmers who grow the country’s only approved GM crop. Bt cotton is being destroyed by the pink bollworm—the same pest it was designed to resist—and other pests to such an extent that cotton farmers across the country are exploring alternative options. In exclusive access to a recent report by the Nagpur-based Central Institute for Cotton Research (CICR), an institution under the Indian Council of Agricultural Research (ICAR), Down To Earth found that there is a severe attack of the pink bollworm across India’s cotton belt. 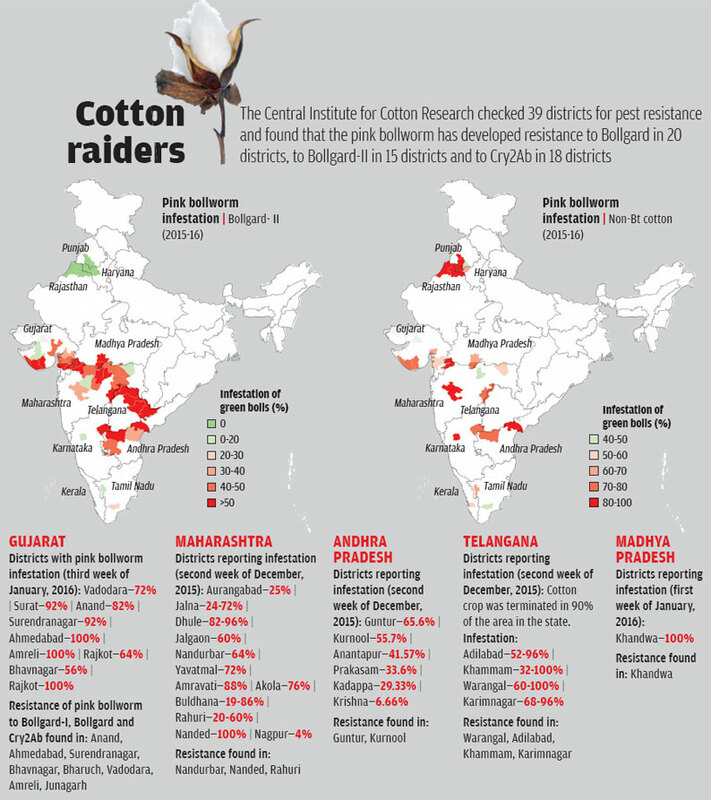 More worringly, the pest has become resistant to Bt cotton across all cotton-producing states in the country. CICR, which has been monitoring the performance of Bt cotton over the last 15 years, conducted the latest resistance monitoring of the crop during 2015-16. It collected pink bollworm larvae from 46 districts in Maharashtra, Gujarat, Madhya Pradesh, Andhra Pradesh and Telangana, where varying degrees of damage had been reported in Monsanto’s Bollgard I and Bollgard II (BG I and II) seeds. The study found that the insect had spread to all the districts, causing widespread damage to the cotton crop in these states (see ‘Cotton raiders’). While pink bollworm attacks have been reported since 2012, the highest infestation was recorded from October 2015 to January 2016 during different picking periods. Gujarat, the largest cotton producer in the country, was the worst-affected with the pest-putting 25-100 per cent of the crops at risk till January 2016. The report estimates that the financial loss due to pest resistance in Gujarat alone was Rs s 5,712 crore in 2014-15 and Rs 7,140 crore in 2015-16. But things are about to get worse for Gujarat, a senior CICR scientist told Down To Earth on condition of anonymity. “By the end of December this year, the state is likely to plunge into a huge crisis as the cotton crop may be wiped out,” he warned. In southern Indian states, CICR found that all the Bt hybrids had become susceptible to the pink bollworm by the second week of December 2015. In Andhra Pradesh, the extent of infestation in green bolls during the third and the fourth pickings was found to be as high as 65.6 per cent in Guntur, 55.7 per cent in Kurnool, 41.57 per cent in Anantapur, 33.6 per cent in Prakasam and 29.33 per cent in Kadapa. Fearing that the pest would destroy the entire crop, farmers in some regions did not even employ labour to pick the cotton. It may be time for cotton farmers to abandon their preferred cash crop. The cost of GM seeds has become prohibitive in the face of declining cotton prices in both domestic and global markets. And the cotton acreage in the country has witnessed a decline. But most of all, cotton farmers are unanimous in their assessment that the dominant variety of the GM seed has failed to fight pest attacks. Kanubhai Vala, a cotton farmer from Gujarat’s Botad district, has been dealt a double blow. In 2015, he lost his Bt cotton crop due to inadequate rain, prompting him to try his luck again this year. Not only did drought conditions persist in 2016, his entire crop was also hit by the pink bollworm. The CICR report says, “(In Gujarat), cotton picked before the end of October was reported to have suffered less damage. But the second and third pickings were most affected.” Except the 0.55 to 0.7 million hectares under the desi Wagad cotton (Gossypium herbaceum) in some districts, all other cotton farms are under Bollgard. Of these, 85 per cent is under Bollgard I or BG-II seeds. Vala’s input costs have also increased. “Seven to eight years ago, the cost of insecticides and pesticides for Bt cotton had reduced to just Rs 50 an acre (1 acre = 0.4 hectare). Today, I spend Rs 2,500 to Rs 3,000, which is more than what I spent on desi seeds,” he says. Vala’s Bt cotton yield has reduced to 20 man (one man makes 20 kg) per acre from 50 to 60 man earlier. Cotton fetches a lower price too, from Rs 1,200-1,500 per man a few years ago to Rs 750-900 per man today. The current Minimum Support Price (MSP) of cotton is Rs 810. “Cotton farmers in Gujarat are simply fed up now,” says Kapil Shah, an agricultural expert who works with Jatan, a Gujarat-based non-profit. He adds that some seed companies are now offering non-Bt seeds in the open market, an indication that farmers may be looking for alternatives to Bt seeds. “My interactions with farmers suggest that if they get a good option, they will desert cotton in two years,” says Sagar Rabari, secretary of Gujarat Khedut Samaj, a farmers’ association. According to the Cotton Advisory Board (CAB) of the Union government, Gujarat’s cotton production has fallen steadily—from 12.4 million bales (of 170 kg each) in 2013-14 to 10.1 million bales in 2015-16. Cotton productivity, which stood at 622 kg lint per hectare in 2015-16, was the lowest in 12 years and 11 per cent less than the last 12-year average. The same situation persists across the country. The overall cotton acreage in India has reduced by around 1.4 million hectares (ha), from 11.6 million ha in 2015 to 10.2 million ha in 2016. 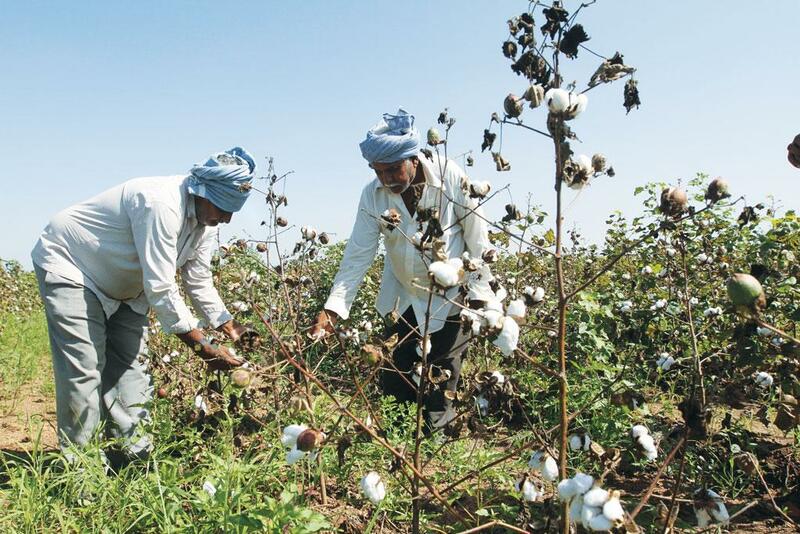 In Punjab, Haryana, and two districts of Rajasthan (Hanumangarh and Ganganagar)—the northern part of the country’s cotton belt—cotton acreage decreased by more than 0.55 million ha this year. At the same time, a new trend is emerging in these states. Prem Kumar, a 56-year-old cotton farmer from Panniwala Mota village in Sirsa district of Haryana, has grown bajra and pulses for the first time in 25 years. After a devastating whitefly attack destroyed the Bt cotton crop in more than 70 per cent of the farms in the region last year, Kumar chose to plant food crops on 10 ha of his total farm area. This part was previously under Bt cotton. 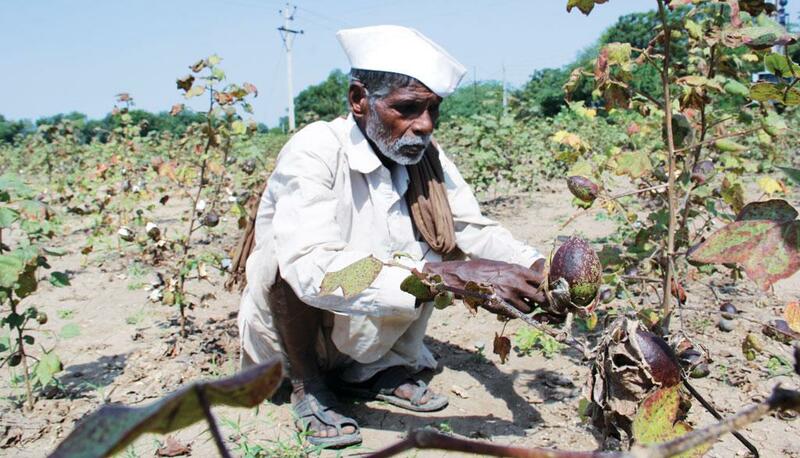 Like him, other farmers seem to be losing faith in the pest-fighting ability of Bt cotton. Many have shifted to native varieties of cotton. “This time, medium and large farmers have become cautious about cultivating Bt cotton on a large-scale,” Kumar says. Ratti Ram Budhania, who owns 2.5 ha of farmland in Ratanpura village of Rajasthan’s Hanumangarh district, has abandoned Bt cotton. “We traditionally grew cotton on at least a quarter of the area. 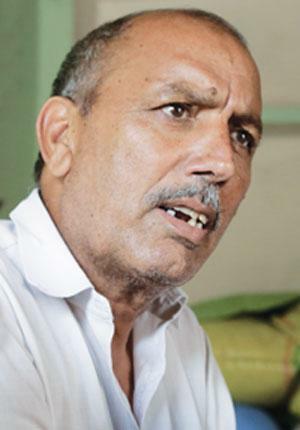 But this time, we replaced it with groundnut and bajra,” says Budhania. This confirms the change in trend, says K R Kranthi, director of CICR (see ‘A strong change in the offing’). For the first time in the past eight years, native varieties were sown in 72,280 hectares in the north zone of the cotton belt. The area would have been more, but seeds were in short supply. The turnaround was primarily because of the severe whitefly attack in 2015 and the leaf curl virus disease that these insects transmit. The pink bollworm has developed resistance only in India, that too in just six years. Pink bollworms in other countries have not developed resistance to Bt cotton, even after 20 years. This has happened because of the long duration (180-240 days) of Bt cotton in India as opposed to short and medium durations (150-180 days) Bt cotton in other countries. Pink bollworm causes damage during winters, only in the first 130-140 days after sowing. The long duration of Indian Bt hybrids allows pink bollworm to survive for an additional 60-100 days, thus allowing them to grow resistance. Unlike other countries, India has a unique system wherein the green bolls on Bt hybrid cotton plants also contain non-Bt seeds. A mix of Bt and non-Bt seeds in bolls provides an ideal condition for bollworms to develop resistance to Bt toxins. Native varieties can give high yields at lesser production costs. But varieties in north India have short staple fibre and are preferred for mattresses, denims and surgical cotton over spinning. Therefore the market is limited. Though the percentage increase in native and non-Bt area is less, it indicates a change in trend for the first time in several years. I can see a strong change in the offing over the next few years. It is not appropriate to compare GM cotton with GM mustard. While Bt cotton is preferred for its efficacy in controlling bollworms, the only advantage with the current case of GM mustard is that it reduces one step in hybrid seed production. Alternatively, there are conventional non-GM cytoplasmic male sterile based hybrid technologies available in the country that could be preferred over the barnase-barstar-based GM hybrids, because they do not pose any threat of contaminating the existing mustard varietal diversity in India. According to CAB data, farmers planted native varieties of cotton on almost 72,280 ha in 2016, two times more last year, in the northern zone of the cotton belt. “The area under native cotton varieties would have been more, but seeds were in short supply,” says Kranthi. He expects that the demand for non-Bt and desi seeds will be even more visible next year in the central and southern zones. After sustaining huge losses from the whitefly attack on their Bt cotton crop last year, farmers in Punjab and Haryana would have preferred to plant seeds of indigenous varieties this year. The cost of native cotton seeds for 1 ha is around Rs 200 as against Rs 4,500 for Bt cotton seeds. Shifting to native varieties is, however, not easy. “We wanted to recover from last year’s economic loss by adopting native varieties. But we get neither quality native seeds nor non-Bt ones,” says Shakti Singh, a farmer from Bhagana village in Hisar district of Haryana. The government must promote native cotton by increasing their MSP, says Ved Prakash, CEO of Hisar-based Satyavardhak Seeds Company. “This year was the best time to give a fillip to native cotton. But the MSP was increased by an insignificant 1.6 per cent and farmers now regret choosing the native variety,” he adds. In addition to the pest problem, the prices of Bt cotton seeds seem to be pulling down India’s first experiment with GM crops. Since Monsanto’s entry in India, the price of cotton seeds has increased by almost 80,000 per cent, from Rs 5-9 per kg in 1998 to Rs 1,600 for 450 grams (a packet of Bt cotton seed usually available) in 2016. A study led by Andrew Gutierrez, professor at the University of California, US, shows that the production cost of Bt cotton has gone up from 8 per cent of total revenues for those averaging yields of 320 kg per ha to 21.1 per cent for those averaging 500 kg per ha, resulting in a net daily income of less than US $2 a day. For farmers getting only 300 kg per ha, the production cost has increased to 42.2 per cent of revenues, resulting in only $1 a day of net income. In addition to the high cost of seeds, Gutierrez says, low yields, high variability and continued use of insecticides are substantial sources of risks. In fact, India is currently locked in an intense legal battle with Monsanto over seed prices. On March 9, the government issued a seed price control order, slashing Monsanto’s royalty on Bt cotton seeds by 74 per cent. The government reasoned that the technology had lost its efficacy in resisting certain pest attacks and, hence, royalty must be reduced. This order led to a fall in the maximum sale price of Bollgard II cotton seeds—from Rs 830-1,000 per packet (450 g) to Rs 800. Royalty decreased sharply from Rs 163 to Rs 43 per packet. In response, Monsanto threatened to “re-evaluate” its India business. Union Minister of State for Agriculture Sanjeev Kumar Balyan says, “Monsanto is free to leave if it does not accept the seed price determined by the government.” The seed price control has been challenged in courts even as the high courts of Karnataka and Delhi have already upheld the order. In December last year, cases of suicide by cotton farmers had spurred the agriculture ministry to bring cotton under the Essential Commodities Act, 1955, that empowers the government to intervene and regulate their trade. 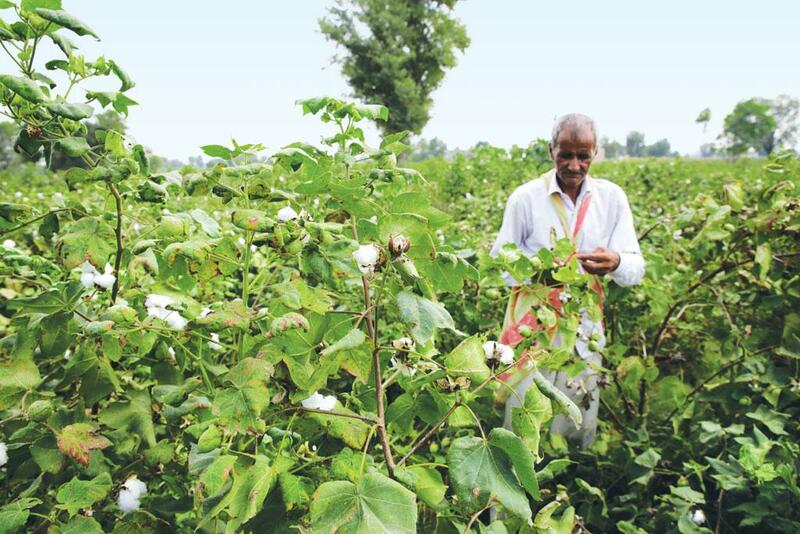 Monsanto’s Bt cotton sales in India have dropped by 15 per cent so far in 2016, says Kalyan Goswami, executive director of the National Seed Association of India, an industry body. Falling sales could cause the industry to lose up to Rs 500 crore this year, say market analysts. In the midst of the cotton controversy, a fierce debate is raging over the government’s decision to allow field trials of GM mustard. However, the Supreme Court stayed the field trials of GM mustard on October 7, asking the Union government to seek public opinion. Anticipating the drop in agricultural commodities, biotech companies are going in for mergers and acquisitions. On September 14, German chemical company Bayer announced it had acquired Monsanto for $66 billion, making it the largest all-cash deal on record. A Chinese government-owned conglomerate, ChemChina, acquired Swiss seed and pesticide company Syngenta. US companies Dow and DuPont also agreed to merge last year. This surge in consolidation of businesses may have something to do with the “efficacy” of GM crops. The GM seeds business is losing its sheen. Since their commercialisation in 1996, the global acreage of biotech crops recorded a decrease of 1 per cent for the first time in 2015. A report by international non-profit International Service for the Acquisition of Agri-biotech Applications states that the decreased biotech acreage in some countries was due to a fall in total crop plantings. Maize plantations declined by 4 per cent, cotton declined by 5 per cent, with the fall being driven by low prices. Many farmers switched from maize, cotton and canola to soybean, pulses, sunflower and sorghum. High rates of adoption of GM seeds of current major biotech crops leave little room for expansion in mature markets of principal biotech crop countries, the report adds. Of the top five countries in terms of biotech crop acreage, the US witnessed a 2.2 million ha decline in 2015. Argentina, the third highest biotech crop-planting country, grew only marginally with 0.2 million ha, and Canada also recorded drop of 0.4 million ha. Last year, 19 countries of the European Union (EU) voted against growing biotech crops. Interestingly, Spain, Portugal, Czech Republic, Slovakia and Romania—the five EU countries that voted in favour—and currently grow Bt maize, have registered a substantial decline in hectarage. The decline in sales is affecting the profit margins of the agribusiness giants. Monsanto saw a fall of around 10 per cent in global net sales in financial year 2016. It cited foreign exchange losses and price declines in agricultural productivity for the dip in earnings. The company has also announced 3,600 job cuts since October last year. “The main reason for the merger boom appears to be this decline in agribusiness profits. Firms are trying to cut costs and, at the same time, find ways to enter new markets,” says C S C Sekhar, associate professor at the Institute of Economic Growth, University of Delhi. Neth Daño, director at the Action Group on Erosion, Technology and Concentration (ETC Group) headquartered in Ottawa, Canada, suggests that the strategic reason for these mergers is the scramble for control over big data and access to patents and commercially useful genetic traits. “The company that can dominate seed, soil and weather data and crunch new genomics information will control the seeds and pesticides markets,” she says. In 2013, Monsanto acquired big data firms such as Climate Corp to access climate and weather information crucial for the development of “climate-ready” crops and inputs. The big mergers will threaten small regional firms and eliminate head-to-head competition in certain seed and chemical markets. They will also become a threat to farmers’ rights and reduce incentives for innovation in biotech markets, experts say. Developing nations like India promise to be lucrative markets. Product introductions by these firms will impact domestic research and development, and Indian companies may be forced to re-evaluate their portfolio strategy. “Small domestic seed firms cannot compete with these merged entities in terms of the research and development budget, market placement and advertisements,” says Ved Parkash Arya, managing director of Shaktivardhak Hybrid Seeds Pvt Ltd in Hisar. 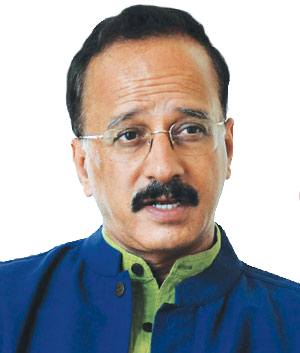 There will be high demand for all kinds of crops, including GM crops, in the future, says Madan Sabnavis, chief economist at CARE Ratings, a Mumbai-based rating agency. “Agriculture is becoming a challenge for countries with rising population and limited land under cultivation. Also, there are certain limitations when it comes to organic growth. This widens the scope for agricultural companies to opt for acquisitions in a shorter period of time instead of organic growth,” he says. This churning in the biotechnology industry makes one thing clear: Native crop varieties and non-Bt crops—despite their natural resistance to pests or low input costs—will continue to struggle against the behemoth of GM crops. Projected as a "silver bullet" for Chinese small cotton farmers, the magic bullet had bitten the dust. I recall at a meeting of the International Committee on Ethics in Globalisation, Per Pinstrup-Anderson, former director general of the International Food Policy Research Institute and a strong votary of GM crops, bemoaned the collapse of Bt cotton in China. In 2015, when the whitefly insect ravaged the standing Bt cotton crop in Punjab, Haryana and western Rajasthan, causing farmer suicides, and violent protests, I thought it was time to pull down the curtains on a questionable technology. 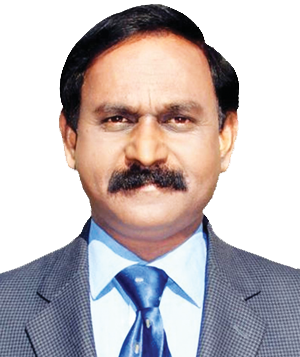 K R Kranthi, director of the Central Institute for Cotton Research, had himself acknowledged: "No significant yield advantage has been observed between 2004 and 2011 when area under Bt cotton increased from 5.4 to 96 per cent." But the drum beaters are at work. And this time, more aggressively. Without drawing any lesson from the Bt cotton debacle, a strong lobby is trying, through a section of the English media, to get the prime minister to brush aside all pointers to the false claims, and get approval for a "junk" GM mustard variety, DMH-11. Although developed by a team of scientists at the Delhi University, there is nothing swadeshi about it. The Delhi University research is actually a Trojan horse for the multinational, Bayer, which will be the only beneficiary with its sale of herbicides expected to increase manifold. The transgenic variety is being pushed on the grounds that the country needs to cut down on its Rs 66,000-crore import bill for edible oils, and, therefore, a "high-yielding" mustard variety will help raise production and reduce edible oil imports. These claims are unfounded. Firstly, edible oil imports are not because of a shortfall in domestic production. In 1993-94, India was almost self-sufficient. The import surge is the outcome of a deliberate reduction in import tariffs over the years bringing it to almost zero. Secondly, there are five existing hybrid varieties that outperform the DMH-11 variety in yield. But the data, for some unknown reason, has not been considered by the Genetic Engineering Appraisal Committee (GEAC). In short, GM mustard provides no additional benefit. And finally, I don't know why agricultural scientists as well as the GEAC are avoiding a "science-based" public discussion about the need and relevance for such a risky and unwanted technology. You only avoid a public debate when you have something to hide.